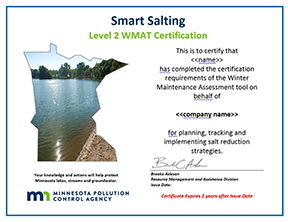 All those that complete training requirements will have their name or their organization’s name listed on the Minnesota Pollution Control Agency’s website. To find out about upcoming training classes refer the MPCA website or our website under Training Calendar. To schedule your own training class please call us at 763-478-3606. 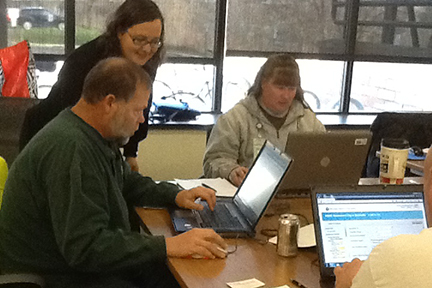 All training materials are on the MPCA website. Fortin Consulting is proud to have developed this training and the training materials for the MPCA. We have taught over 10,000 people through these classes since 2006. This training is based on the Minnesota Snow and Ice Control Field Handbook for Snowplow Operators. It is focused on improving efficiency and reducing environmental impacts of winter road maintenance. Minnesota is the first state to offer certification for winter parking lot and sidewalk maintenance. All plow drivers, maintenance workers, building managers or others who are involved in winter parking lot or sidewalk management are encouraged to attend. This training is for leadership in winter maintenance. 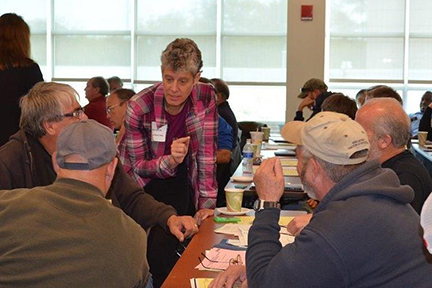 The Winter Maintenance Assessment tool (WMAt) is featured in this training. Fortin Consulting created the level 2 training and WMAt for the MPCA and we teach the level 2 training class.